It’s smaller than it looks. Not now, mind you – ever since I moved in with The Boyfriend I’ve had a nice, sizable kitchen to cook in, should that be what I want to do. Of late, this whole calorie-counting thing has made me less and less inclined to cook because it means doing more math and being a lot more precise with things like measurements. Not like the good old days when I just chopped things willy-nilly and wasn’t satisfied until there was enough food in the pan to feed several Russian armies. Regardless, if I do want to cook, I can, and I have three burners, a microwave, and even a little fish oven (which I never, ever use). Prior to this, though, I lived in a Kyoto apartment that redefined my understanding of what “a small apartment” means. When my family came to visit, there was just barely enough room in there for everyone to stand around and admire how little room there was. The smallest part, of course,w as the kitchen. It consisted of the sink and a small counter, maybe about 60 cm to a side. On the counter I was able to put my rice cooker and a gas burner that hooked into the main gas line, and that was my kitchen. The whole thing. Behind me, if I was standing at the sink, was the fridge, which had a microwave on top of it, and a toaster oven on top of that. 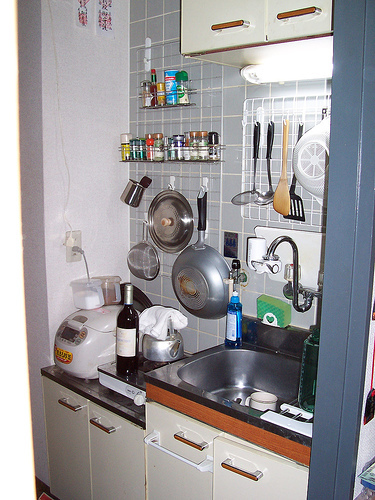 Still, it was the smallest kitchen I had ever known, and nothing in my kitchen experience had ever prepared me for how to deal with having a kitchen that small. This became soup. A rather good soup, if I recall. The thing is, though, I did a lot of cooking in there. It was a complex system of carefully positioning various containers and bowls, balancing things and putting them anywhere there was a flat surface, but I managed. And since I had no one to cook for but myself, I found myself trying out new things and experimenting a lot more than I did once I started cooking for both me and The Boyfriend. I would stop at the supermarket on the way home, come up with something to cook, and that was it. What’s more, I had to learn to cook things in only one pan. Not for me the multiple pans going all at the same time, no. Whatever I made had to be easy to contain. between the single burner and the rice cooker, that was all I had available to be. Put together, I think that was a good period of training. 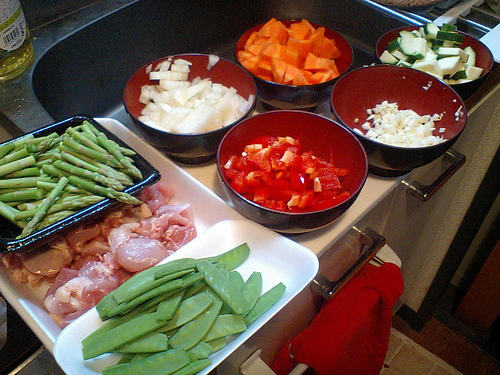 I learned to experiment with cooking, to maximize efficiency and use of space. I learned how to cook simple things that tasted good and didn’t require vast reservoirs of skill. When I got to the new place and its vast acreage of bench space and three – THREE – burners, I almost didn’t know what to do with myself. It was wonderful. So I’m thankful for my tiny kitchen, for forcing me to be creative and to work within limits. That’s a better lesson than most of us realize.